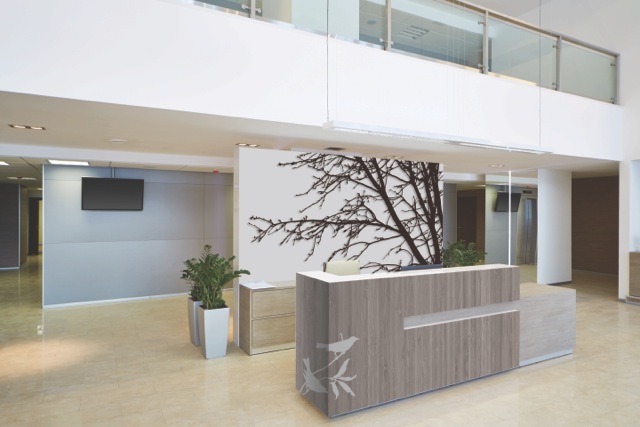 MONTGOMERY, MN – BioSurf today announced the launch of BioSurf 2DL, a line of digitally customizable, sustainable laminates for vertical and light horizontal surfaces used in commercial interiors, according to BioSurf president Mike Riebel. “What sets BioSurf apart from other laminates and decorative surfaces is its ability to match the look of other building products,” Riebel said. “And we can replicate other materials—using images—through a process that does not compromise environmental health. Bio-based and comprised of corn and soy byproducts, BioSurf 2DL laminates are available in more than 100 standard colors and textures and can be used in a virtually limitless variety of surface profiles and substrates. Typical applications can include wall paneling, tables, store fixtures, interior doors and cabinetry. BioSurf 2DL is manufactured through a process wherein a corn and soy biofilm is laminated to a FSC-certified saturated paper backer, after which the composite sheet is sent through a wide-format HD printer, where a variety of standard patterns or images— or, alternatively, a custom user-supplied image—are printed onto it. After the laminate is printed and cured, a final protective coating is applied. All BioSurf products are Red List Free and do not contain any materials or chemicals in conflict with The Living Building Challenge 2.0. BioSurf products can contribute to the following LEED Credits: MR 6 (Rapidly Renewable Materials), EQ IEQc 4.1, 4.2, and 4.3 (Low Emitting), and MR 5.1 and 5.2 (Regional Materials) where appropriate. BioSurf is a subsidiary of Biovations Holdings, which was founded by Mike and Milton Riebel on cornerstones of sustainability and environmental health that date back to the early 1990s, when bio-based raw materials were used to create a wide variety of building products. The company’s flagship product range, BioSurf, is made from 100% rapidly renewable resources (corn and soybeans) and is the first laminate surfacing product to be completely devoid of formaldehyde. BioSurf laminates are used for a variety of applications, including but not limited to table tops, store fixtures, work stations, desk tops, conference tables, wall panels, floor and ceiling tiles, custom signage, advertising, graphics and more. For more information visit http://biosurfsolutions.com.